Many people have heard of the 4Cs of diamond education, when it comes to selecting an an engagement ring. Choosing a diamond can be difficult so we're going to explain the basics of the 4Cs, as well as explain how StyleRocks has simplified that diamond choice. The following is intended as an overview only; more information can be found about the 4Cs of diamonds on Wikipedia. The Gemological Institute of America also has a good guide on what to consider when purchasing a diamond for an engagement ring. Carat: this refers to the diamond's weight, which is an expression of its size. Diamonds can start at 0.01ct (although this is very small) and increase in size until a massive 20 carats. Typically a diamond for an engagment ring will start at approximately 0.2 carat - measuring approximately 3.8mm in diameter for a round brilliant cut diamond. Cut: Typically, this is used by many people in reference to the diamond's shape: round, pear, princess, emerald, cushion, marquise and so on. However, the diamond's cut actually refers to the way in which the diamond has been transformed from the 'rough' through to the proportions of finished product. Cut ranges from good, to very good, to ideal. Clarity: Clarity is an expression of how many flaws or 'inclusions' can be found within the diamond. To find a flawless diamond is very very rare, as they are a natural occurence within the earth, and are not man-made. Many inclusions however, are invisible to the naked eye and can only be seen wtih a loupe or magnifying glass. Clarity ranges from SI2 (at which point inclusions may be visible to the naked eye) to Flawless. Colour: The 'higher' the colour, the more white and sparkling a diamond will be. For example, a D-coloured diamond is visibly whiter and brighter comparde to a J diamond, which can appear brown and a little 'dirty'. In addition to the 4Cs, there is also Certification and Cost. Certification: Each diamond comes with a certificate from the Gemological Institute of America (GIA), stating the diamond's exact specifications with regards to shape, cut, carat, clarity, and colour, as well as some other information around fluoresence and symmetry. This helps consumers understand that the diamond is authentic and certified by an independent international organisation. In addition to this, each StyleRocks ring is accompanied by a valuation certificate provided by an accredited valuer from the National Council of Jewellery Valuers. Cost: Diamonds are a naturally occurring gemstone found in the earth's crust. Each year, the number of commerically viable diamonds of a sufficient standard for use in jewellery is highly limited. The range of quality within those diamonds is highly variable too. For example, the number of diamonds which are of a higher colour standard (such as D, E, F) is fewer than those with a lower colour. Equally, the number of diamonds with few inclusions is limited. This limited supply, when faced with strong and ongoing demand, is the key determinant of price. Essentially, the better the quality of diamond, the higher the price. From the above, you can see that shape (cut) and carat are easy to understand. However, the tradeoffs between colour and clarity - and their impact on price - are hard to understand harder to quantify. The colour difference between an E and F diamond cannot be seen with the naked eye, nor can the difference between VVSI and VSI when it comes to clarity. So how do you know which diamond to choose? To solve this customer confusion, we've simplified the selection process. We've designed engagement rings where every central stone measures 1 carat in size, taking the view that 'bigger is better' when it comes to girls and their diamonds (trust us on this one). To accommodate different shapes, we offer many options based on popular styles. 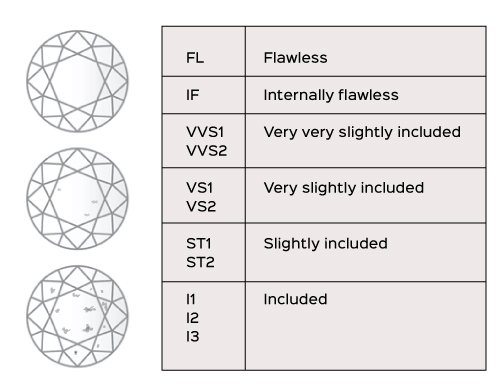 To addres the colour/clarity tradeoff, we have 3 'grades' of central diamond for each style: A, AA and AAA. 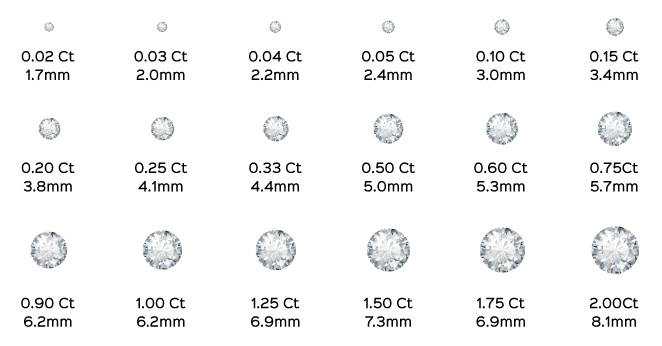 The grade depends on the diamond's clarity and colour and is reflected in the price. For example, an A grade diamond for a round brilliant cut stone is G/H colour, SI2 clarity while a AAA grade diamond is E/F colour, VS clarity. The diamond's colour and clarity is clearly defined in the accompanying information when you customise your engagement ring. As a customer, you only need to decide on the style of engagement ring - and the grade of diamond. *Any engagement ring purchased via Paypal Instalments needs to be paid for in full prior to receiving the ring. For more information, you may want to read about what the Sydney Morning Herald, & Polka Dot Bride - Australia's biggest wedding blog - have said about this innovative approach to disrupting the diamond trade with our custom engagement rings.